Theresa May is currently the UK Prime Minister (PM), and indeed she may remain so for a long period of time. However, if she goes, who would be likely to succeed her? We have looked at some of the numbers associated with the last 8 PMs to see if there is a clue to who might come next. We will show 3 key factors that we believe the last 8 PMs have in common, and then see if any of the current candidates for the Tory Party leadership share the same characteristics. If this happens before the next General Election, then we could be talking about the next PM! The majority of the last 8 Prime Minsters have all come into the job having had previous experience of a major office (either minister or shadow minister), as well as experience of more junior ministerial or shadow ministerial roles. The current Prime Minister served as Home Secretary for over 6 years before becoming PM, and held a number of shadow ministerial posts before that. Holding a key ministerial or shadow ministerial post such as Chancellor, Foreign Secretary or Home Secretary ensures that you get more media attention and are taken more seriously by your party, so having held a top job is a pretty good indicator. As being a shadow for one of the key offices is almost as good as having the key office, so being shadow leader of the party is also good enough. As such David Cameron held a key office for many years before becoming PM. As indeed did Tony Blair and Margaret Thatcher. The other interesting person to consider here was John Major. He only held a top job for 16 months, which is much less than the other PMs. He also did not have as much experience of other official responsibility as the other PMs, having only around 3 years of experience. It does appear that to be PM, you need to have held one of the major offices for at least a year, and have a total of 4 or more years of office experience. Being Prime Minister (and indeed Leader of your party) is a busy job. And it would be difficult to do that job if you had to spend a lot of time in your constituency making sure that you won your seat in the next election. As a result, PMs tend to have larger majorities than a number of their colleagues. 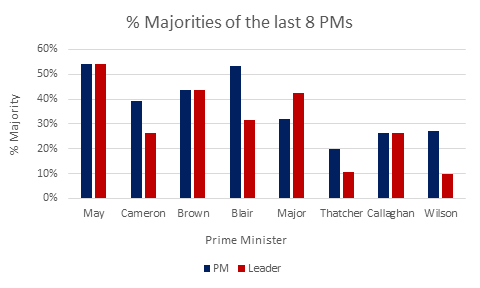 The average majority of the last 8 PMs at the point at which they became PM was around 36%. And there was only one with a majority of less than 20%, and that was Margaret Thatcher with 19.8%. But what about their majorities when they became leader of their party. This is also shown in the chart below. Some of these were considerably lower, both Thatcher and Wilson had majorities of around 10% in the years in which they were elected leader, although their majorities were on the way up. So we would expect a future leader and PM to have a majority of around 10% or more in their constituency. Another sign that a candidate will go on to become the Party Leader and PM is when they grow the size of their majority in their constituency. The chart below shows the change in constituency majority, for the last 8 PMs, from the time that the PM took over their seat to the time that they became Party Leader. 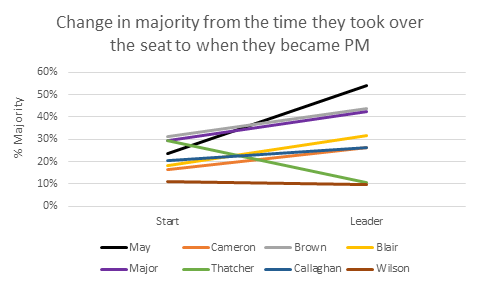 Of the last 8 PMs, only 1 had a majority that reduced over time before they became PM. Margaret Thatcher inherited the constituency in a good year for her party, and became leader of the party in a bad year. However, by the time she became PM, her majority had risen again and she was getting majorities of 20% or more. Harold Wilson also had an interesting journey, taking on his constituency in a good year for his party, but then seeing the majority slip to less than 5% for 2 consecutive elections. However, in the next 20 years he was able to grow the majority to over 20%. So in general it does appear that a PM will have had experience of growing the majority in their own constituency. So of the potential Tory challengers, who meets these criteria? It is difficult to judge who may be the next Tory party Leader as there are potentially over 300 people to choose from. However, we have decided to consider what we think are the top 8 candidates, who are basically the 5 people who stood for the leadership in 2016, and the current Chancellor, Phillip Hammond, and Home Secretary, Amber Rudd, as well as David Davis who has stood for the leadership before. So how do they measure up to our Prime Ministerial criteria? We have considered each candidate against each criteria, giving them a score from 1 to 3 depending on how closely they fit the criteria. On the whole there is not a lot of top experience amongst these candidates. The one with the most is Phillip Hammond who has been Foreign Secretary and Chancellor, but only for a few years. Boris Johnson and Amber Rudd are the other current holders of the top jobs, but again only for the last year. Of the other people who have held top jobs recently, George Osbourne and William Hague are not sitting MPs and the other person is the current PM. Boris potentially comes out on top in this poll as he did spend 8 years as Mayor of London, which whilst not technically a top political role, this did still effectively give him the same level of coverage as the others. Of the 8 candidates, 5 achieved majorities of over 20% in the last election, despite this not being a good election for their party. Boris Johnson gets 2 ticks against this criteria as he still got a fairly solid 10%. But Amber Rudd and Stephen Crabb get no ticks as they are both defending majorities of less than 1%. When considering growth in their constituencies, we should look back beyond the most recent election which saw a reduction from 2015 for all but one of the candidates. Boris Johnson has had 2 constituencies, and whilst he did grow his first, his current constituency has fallen quite a bit, so he gets no ticks. 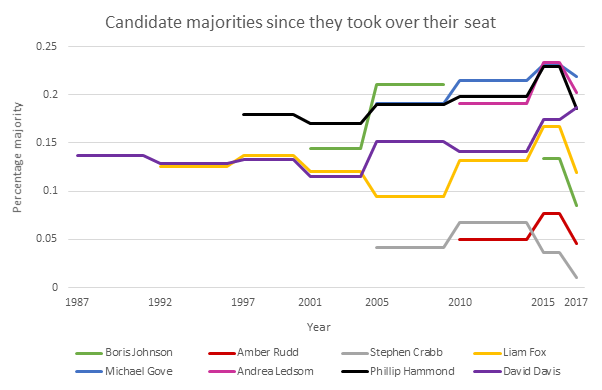 Amber Rudd and Stephen Crabb both get 1 tick for originally growing their constituencies a little, but again their majorities have now fallen back down. I have also placed Andrea Ledsome in the same category, as although she has a healthy majority, it is only slightly above where it was when she took over the constituency. The others have all grown their constituencies, with the standout performer being David Davis, who was the only candidate to grow their constituency at the last election, and has achieved a very good growth since the constituency was created in 1997. Michael Gove, who has increased his majority from 22.7% to 43%, also scores well.